Reading today’s Adelaide Advertiser I spotted two quotes that amused and concerned me!! “He couldn’t explain why he had been so truthful”. Will we ever be able to believe a SACA spokesperson in future? Perhaps the media got it wrong … so I checked the SACA website. All I found there was the official Media Release written in the predictable old fashioned impersonal language of the PR professional of the past. Hoping that the media would be lazy enough to just lift the quotes and not ask their own questions. No sign of a Blog where I could perhaps have my say! No sign of a Video of the Media Conference so we could see and hear exactly the context in which the statement was supposedly made. As expected no sign of Twitter or Facebook to build conversation … Just the old one way web site — the SACA tells and you will listen. In the hope of finding some connection with Web 2.0 and Social Networking/Media I went to LinkedIn assuming that given the international nature of the sport I would find SACA’s General Manager Commercial, Terry Davies, who will fulfill the role of Acting Chief Executive. I thought I would email him a copy of the Grumpy Old Managers Guide to Social Media so that he makes sure in future they leverage Social Media rather than rely totally on Traditional Media. But alas no Terry Davies at SACA or within 15 kms of me!! The only evidence of Web 2.o on what appears to be an expensive but, by today’s standards, a fairly ineffective site was an RSS feed of the latest news in cricket … But it seems that one of the search terms for the RSS is Ashes. That sounds fair … but today one story caught my eyes as the news scrolled through. It seems some animal activists have stole the ashes of the deceased mother of the CEO of Novartis … and it’s ended up in the cricket news … OOPS. I guess no one was looking and it went straight through to the boundary for 4!! The other story in the ‘Tiser that caused some amusement concerned the raid by Federal Police on a Terrorist Network planning to blow up an Army Base near Sydney. I wonder if they put the Media Release out before or after the raid … or perhaps he was Twittering it as he passed by … maybe ASIO get it after all?? And on tonight’s TV News I see there is now an investigation into how the media knew about the raids before the raids were conducted … maybe it really was on Twitter!!! The times they are a changing… thank goodness!! We all know that the pace of change is now faster than ever. But on a day when Kodak announced the death of Kodachrome which 74 years ago revolutionised colour film and went on tto be an iconic brand, I am still bemused by peoples reluctance to accept the benefits that Web 2.o etc can bring. The fact that I am in bed writing this on my SmartPhone which is linked to the wireless network that drives several other devices in the house is further evidence of what is happening around us daily… yet many won’t embrace it. The Media section of The Australian Newspaper which once only talked of Radio, TV and Print this week featured a major story on each if its six pages on Web 2.0 tools and technologies … Twitter, blogs, YouTube, MySpace all featured in big bold headlines along with articles on the the web helping newspapers survive and measuring website hits. And now I read in Chris Brogan’s Blog of a new iPhone app to make it easier. Introducing Dunkin Run. The tool is just a simple ordering and setup tool that lets you email or text your friends, tell them when you’re leaving, and give them the option of ordering stuff from Dunkin’ Donuts. A great use of the available technology to make life easier for people to do business with you. But there is some light appearing and a chance that the Grumpy Old Manager will embrace Social Media Marketing … especially when our Guide is released this week!! While the rate of broadband take up grew only 1% in 2008 it has grown by 6% to 63% up to April 2009. In the past 12 months the 65 or older segment has gone from 19% to 30% and those 50 – 64 from 50% to 61%. Interestingly the highest growth rates (34%) came from those in the lower income groups. While the well educated and well paid group remained stable at 85% adoption of broadband in the home. So all people, especially older people, are increasingly using the Internet at home … as such it is a great place to reach key consumer groups more than ever. Eric is Right … again! In my previous post I included an email from a client (Eric) who among other things said most blogs were simply people repeating things others wrote. Well I am about to prove him right again! I am not sure about others but this blog exists as a repository of useful info I find with my interpretation added or merely my endorsement. I find this a useful approach to build a history (a weblog) of my thoughts/views in this area and a repository for my clients. Today a post by David Henderson – author, journalist one of my favorite bloggers/writers on PR topics sparked my interest. For many years we have known the Press/Media Release doesn’t work but we have churned them out because we couldn’t think of any better way and/or the clients expect them and measure your productivity by them. David today highlights what Journalists expect and how their needs can be easily met simply and easily. His recommended approach has worked well for us … so its great to hear we are on the right track. Below is an excerpt that took my fancy but ….It is well worth visiting his blog to read his thoughts in full and in fact well worth downloading his eBook and then buying the book. I know that most news releases today have morphed into something else that’s not really intended for the media but rather as self-serving promotion for organization, glowing announcements of generally trivial nature to make the suits in the corner offices happy. But the morphing has polluted the media waters, and here’s why – many PR agencies today are shoveling out news releases to the media in a style that has not changed much for decades, except that today’s digital delivery methods have replaced envelopes, stamps and fax machines. It no longer works. I have also taken the liberty to re-use the graphic from David’s blog and add his credit to Tom Foremski and SiliconValleyWatcher for the Die Press Release graphic. It’s from a story Tom wrote on the subject in 2006. Has Email had its day???? Having been hooked on email in one form or another for more than 25 years some recent research has been thought provoking. I started using it on a large Corporate IBM Mainframe on the other side of the world when I worked for a large Software Multi National in the eighties. And then the 90s saw it as the vehicle that took the Internet from the geeks (like me in those days) to the world at large. But now Neilson and Co., a member of the Dun and Bradsteet group who gave access to email all those years ago, tell me that Email is on its way out. A recently released report shows that Social Networking and Blogging are now more popular than using email. Whilst the research didnt cover Busainess email… I think the trend is very significant. While email has been great for one to one or one to many communicationSocial Networks/Blogging encourage Collaboration and Knowledge Transfer. It is the potential efficiency of communication and collaboration that will see various forms of Social Networks emerge and overtake the role of email. Whilst many businesses look at Facebook etc as a time waster they should be looking at how to harness the power insted. Perhaps with tools like Blellow …. Blellow is a fascinating collaboration tool a bit like Yammer but Blellow allows you to create groups based on projects – a bit like Twitter meets LinkedIn and beyond! With Social Networking being a global phenomenon, the reach is virtually limitless too. In Brazil 23% of time spent on the Net is spent on Social Networks and Blogs, while in Germany it has gone from 39% at the end of 2007 to 51% at the end of last year. Email has been a great one to one medium where the new tools are all about building communities and connecting with people you know. 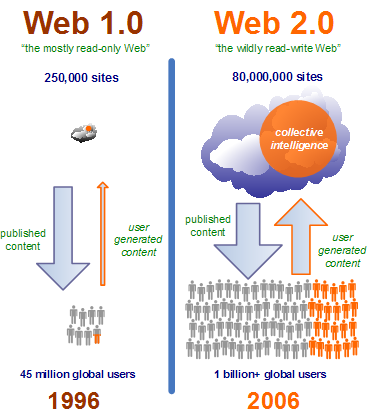 First there was Web 2.0 which defined the tools and tactics that have driven the web to be more interactive, conversational… a two way street. Then I noted PR 2.0 …communicating directly with the market not just the media, so I started this blog to write about things I find relevant to my business eNova Communications in the Web 2.0 world. This raises the question is there any relevance at all to whatever 1.0 was ….. and now I am hearing about 3.0 what the hell is that? But for now I guess its time for me to refer to myself from now on as me 2.0!!! Or should I perhaps change my name to Rick Carter 2.0 … perhaps?? Or would I need a blog about myself to justify that? ?